For this show, Father Umberg and I cook in memory of our dear friend, Mari Lou Ollier. The lasagna recipe is her’s. Spread the zest around the skillet let boil for a few seconds and turn off heat add sugar, salt, and Balsamic Vinegar. Let it cool to room temperature then add the pecans and craisins. 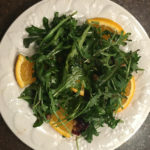 Put the Arugula in a bowl add dressing mix well and serve or refrigerate for 30 min. Saute onion, garlic and meat in pan, stirring frequently until browned. Add sugar, 1 tablespoon salt, basil, fennel, pepper, and half of parsley; mix well. Add tomatoes, tomato paste, and ½ cup water mashing tomatoes with wooden spoon. Bring to boiling; reduce heat; simmer, covered and stirring occasionally, until thick 1 ½ hours. In a kettle bring 3 quarts of water and l tablespoon salt to boiling. Add lasagna, 2 or 3 at a time. Return to boiling, boil uncovered and stirring occasionally about 10 minutes. Drain in colander. Preheat oven to 3750. 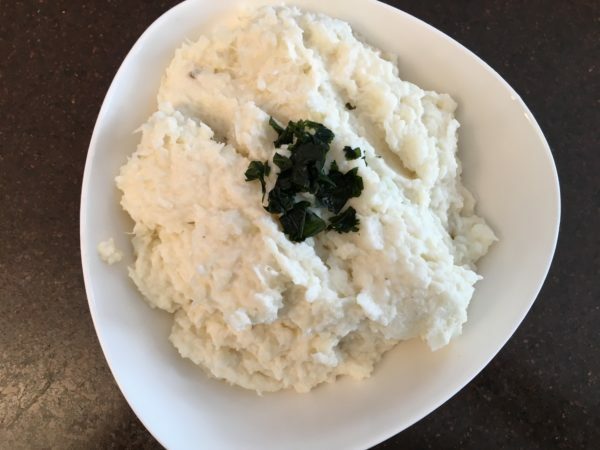 In a medium bowl, combine ricotta, egg, remaining parsley, and salt; mix well. 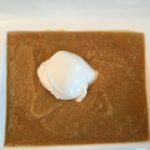 In bottom of 13 x 9 x 2 inch baking dish, spoon 1 ½ cups sauce. 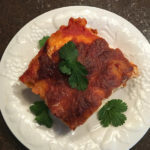 Layer with 6 lasagna, lengthwise and overlapping, to cover. Spread with half of the ricotta mixture, top with third of mozzarella. 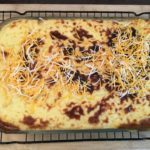 Spoon I ½ sauce over cheese; sprinkle with ¼ Parmesan. Repeat layering, starting with 6 lasagna and ending with 1 1/2 cups sauce sprinkled with parmesan. Spread with remaining sauce; top with rest of mozzarella and parmesan. Cover with foil, tucking around edge. Bake 25 minutes· remove foil· bake uncovered 25 minutes longer, or until bubbly. Cool 15 minutes before serving. Kathryn and Father Umber enjoy cooking recipes for Oktoberfest. 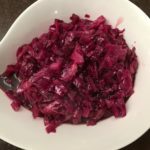 Today they are preparing Sauerbraten with noodles, red cabbage, and Brussel sprouts. Enjoy! Add vinegar, wine, water, cloves, onions, and salt into a saucepan. Bring to a boil then simmer for 10 min. Add pickling spice and simmer another 10 min. Cool to room temperature. 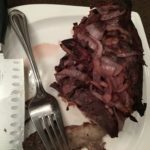 Place beef rump roast in a large pot. Cover with brine and refrigerate for 2 to 3 days. Important to turn meat daily. When you are ready to roast the meat, preheat the oven to 360-375 degrees. Remove meat from brine and pat dry with paper towels, reserving the brining liquid. Roast the beef until tender, about 50 to 60 min. Remove beef to a platter and slice. While the meat is roasting, boil water for noodles and cook according to package directions. (If using pasta, cook beyond al dente). Drain and put in a large serving bowl. Strain solids from remaining liquid and continue cooking over medium heat. Add crushed gingersnap cookies and simmer until gravy is thickened about 10 minutes. 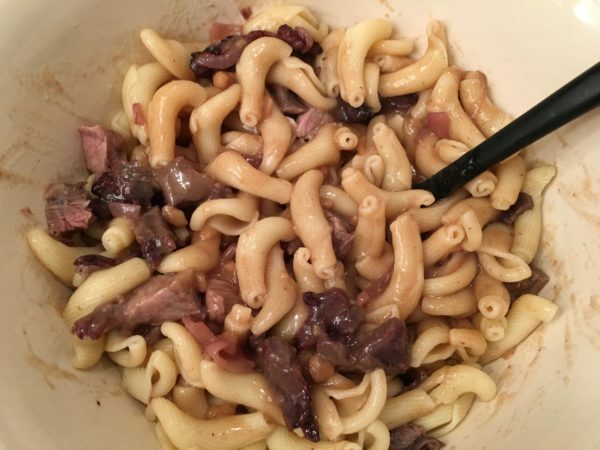 Serve gravy over sliced beef & noodles. Sauté chopped onions in Butter and olive oil. Then add shredded cabbage stir with the sauté onions. Add vinegar, water, salt, pepper, and cloves. Mix in chopped apples. Cover and Simmer half an hour. After simmering whisk in jelly/preserves. Finally, Put in Serving Dish serve with Sauerbraten over noodles. In a large frying pan melt the butter and add oil and heat on low add the Brussel sprouts to the melted butter and oil and coat the sprouts. Add instant onion add Cayenne pepper to the mixture and simmer for 10 minutes then add ¼ cup of water then they will get a little brown and crunchy add salt and then Hoisin Sauce coat the Brussel Sprouts and cook for 1 minute on low. Serve with Sauerbraten and noodles. Kathryn enjoys cooking with her friend, Terry Young. 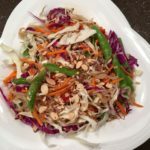 Watch as the two prepare some Southwest and Asian fusion favorites. Rinse corn and black beans in a colander. Mix all salad ingredients in large salad bowl. Combine yogurt, 3 tablespoons oil, and juice in a large bowl, stir­ring with a whisk. Stir in poblano, green onions, and bread; let stand 10 minutes, stirring occasionally. Place yogurt mixture in a blender with cucumber, sugar, salt, black pepper, and tomatillos; blend until smooth. Heat 1 teaspoon oil in a large non­stick skillet over medium-high. Add shrimp to pan; cook about 2-3 minutes per side. 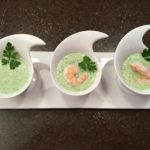 Place 1¾ cups cucumber mixture in each of 4 bowls; top evenly with shrimp. Add Parsley leaf to decorate. 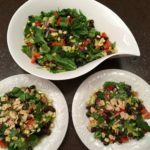 Combine all salad ingredients in a bowl and mix. Combine all dressing ingredients in a blender and blend. Pour dressing over salad mix, toss and sprinkle sesame seeds over top. Serve on colorful dishes. This salad and dressing will taste delicious for several days. Place chicken into a ziplock bag and pour marinade over it. Seal and distribute marinade until all chicken is coated. Marinade at least 30 min. Next, add olive oil to pan on medium high heat. Heat oil until hot but not smoking. Pat chicken dry with a paper towel and place in hot pan. Cook chicken until 160 degrees and remove from heat. Cover and rest chicken until it reaches 165 degrees. 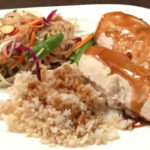 When ready to serve, drizzle with remaining Teriakyi sauce and serve with brown rice or Quinoa. Combine all ingredients (except cornstarch) in a blender and pulse until combined. Use 1/2 cup for the marinade. Pour remaining blended ingredients into a small saucepan and bring to a boil. Once the sauce begins to boil, immediately reduce to simmer. Mix cornstarch and water and add to sauce, stirring constantly until it thickens (about one minute). Serve with Brown Rice, cooked according to directions. Kathryn prepares some of her favorite dishes from Britan, Ireland, and Scotland. Cook sausages in medium saucepan or skillet until they are browned and cooked thoroughly. In the same pan add butter, olive oil, and onions, cook for 3-5m minutes until their lucent. Add Chicken stock and red wine and cook for another 3-4 minutes until reduced. Add Heavy Cream and cook another minute or two. Season with Salt and Pepper. Cook cauliflower until tender. Mash* and add butter and cheese whip till you have the consistency of Mashed Potatoes. Fold in Cheese. *Add hot cooked cauliflower to a food processor. Add butter and cream and pulse until the consistency of mashed potatoes. Pour into serving bowl and fold in cheese. 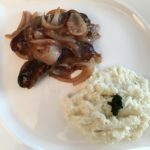 Plate the Sausage and onions and the gravy add ½ cups Mashed Cauliflower to the plate and serve. Garnish with Parsley. Put the measured water and or Vegetable stock in a large soup pot, with a teaspoon of salt. Bring to boil (skim any scum off that rises to the top) then let it simmer. In a medium frying pan, saute the onion, carrots, celery and turnip/rutabaga in the olive oil for about 6 or 7 minutes on medium heat. Remove from the heat. Add the red lentils and the sautéed vegetables, and another teaspoon of salt; stir well and let simmer for about 30-45 min or until lentils are tender. Season soup with salt to taste and freshly ground pepper. The night before you want to make the dessert, toast 1/3 cup (2 oz) of the oats in a cast iron or very heavy pan until very lightly browned- this won’t take long, so keep a close eye, as you don’t want burnt oats. Next, put these oats in a bowl and cover with 1/3 cup (3 oz) of whiskey. Cover and let stand overnight to soak. When you are ready to make the Cranachan, toast the second batch (1/4 cup) of oats, exactly the same as you did the first ones. Remove from heat and set aside to cool. Now, choose a few choice raspberries to decorate the tops and set them aside. This is the part that is different: sprinkle the raspberries with 2 teaspoons of sugar, 1 tablespoon of honey and 1 tablespoon of whisky. Mix well and set aside. Whip the cream until it starts to thicken, then add the other 2 tablespoons of honey, and 2 tablespoons of the whiskey. Continue to whip until stiff peaks form. Next, gently fold in the whiskey-soaked oats. At this point, we are ready to assemble the dessert. 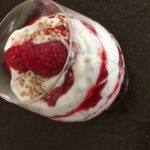 I would recommend doing this relatively close to serving time as the dessert will taste better fresh (if possible, don’t make it in the morning to serve for dinner). In this show, Kathryn and her friend Terry, prepare some quick and easy meals. Combine 2 tablespoons oil, soy sauce, sugar, and vinegar in a bowl, stirring with a whisk. Heat remaining 1 Tablespoon oil in a large nonstick skillet over medium heat. Turkey or chicken and cook for 7 minutes or until lightly browned, stirring to crumble. Add 1/4 cup soy sauce mixture; cook 4 minutes or until liquid is absorbed. 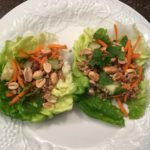 Place about 3 Tablespoons Turkey or chicken mixture in each lettuce leaf; top evenly with cucumber, carrot. Drizzle evenly with remaining soy sauce mixture. Sprinkle with mint, parsley, or cilantro. Top with chopped peanuts. PER SERVING - 1 cake equals 290 calories (you can cut the calories by using Splenda) Note: I personally only ate half and served the other half to my loved one. Pour 1 tsp butter into each of two 10-oz. ramekins coated with cooking spray. Sprinkle with brown sugar. 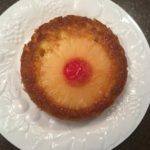 Top with a pineapple slice. Place a cherry in the center of each pineapple slice; set aside. In a small bowl, combine the flour, sugar, baking powder, salt, and nutmeg. Beat in the milk, vanilla, and remaining butter just until combined. Spoon over pineapple. Bake at 350° for 20-25 minutes or until a toothpick inserted near the center comes out clean. Cool for 5 minutes. Run a knife around edges of ramekins; invert onto dessert plates. Serve warm. In a large saucepan, heat canola oil over medium-high heat. Add onion and celery; cook and stir 2-4 minutes or until tender. Add remaining ingredients. Bring to a boil. Reduce the heat; simmer, uncovered, 10 minutes to allow flavors to blend. Puree the soup using an immersion blender. If you are using a regular blender, make sure the opening on top is open and cover with a dish towel. Top with croutons, day-old bread cut up into cubes (French bread). 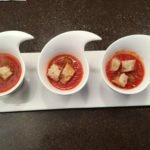 Serve in small bowls. You can freeze the soup, as well, just make sure it is completely cool before freezing. 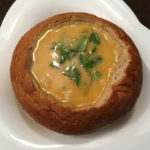 1 8 inch Rounded Rye or Wheat Bread – Cut off the top of the round bread and scoop out the Breadthe center as you are using this as a serving bowl for the soup. Melt butter in a large pot or skillet set over medium heat. Add flour and whisk until smooth. Cook 2-3. Add broth, beer and stir until thick. Next, add Cayenne and Black pepper, ground mustard, and Worchester sauce. Once all is combined, stir in the cheeses. Continue cooking until cheese is melted. Reduce heat and simmer 10 min. Serve in a Bread Bowl. Will serve 2 to 5 people. Rather than getting one round loaf, purchase smaller bread bowls and serve individually. 6 oz bulk pork, turkey or Chicken Sausage Links can be used, just cut out of the skins. 2 stalks celery thinly sliced. Combine sausage, bread crumbs, egg, and 2 Tbsp. green onion; mix lightly but thoroughly. Shape into ¾-inch balls. In a large saucepan, bring the chicken broth and soy sauce to a boil. 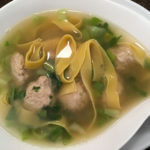 Carefully drop meatballs into soup. Stir in the bok choy (or spinach), celery, and noodles; return to a boil. Cook, uncovered, until the meatballs are cooked through and noodles are tender, 10-12 minutes. Stir in basil and remaining green onions; remove from heat and serve delicious! 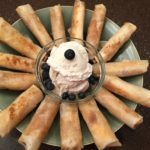 In this episode Kathryn Raaker and her friend from the Philippines, Maria Dunaway make her special dessert Turon or in English Fried Plantain/Jackfruit Rolls really yummy!! Separate spring roll wrappers (same ones used for making eggrolls)	Cut bananas lengthwise in 3 inches to fit less than the width of the wrapper Roll banana pieces in brown sugar Lay each wrap on a board, l say a slice in the middle. You could combine both fruits if preferred. Roll in envelope fashion, seal edge with water. Heat oil in medium setting. Carefully lay each roll seam side down Fry on each side till light brown. Then sprinkle oil with more brown sugar to caramelize if preferred or make syrup in separate saucepan. Lift carefully from pan. Cool off on racks with paper towel underneath. (laying the rolls directly on the towels will make it stick) Eat immediately for crispness. Serve with your choice of ice cream or fruit shake. Ideal for breakfast and snack too. 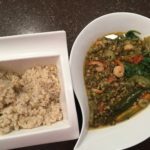 In this episode, Kathryn Raaker and her friend Maria Dunaway from the Philippines share with you one of Maria’s favorite Filipino dishes Mung Bean Stew.